Introduction: The anterior approach to cervical pathologies is a time-tested versatile approach. It is, however, associated with a number of pharyngo-tracheo-laryngeal complications (PTL complications) such as dysphonia, dysphagia, and aspiration, more commonly in high cervical C3-4 inclusive pathologies and even more so in patients with “difficult neck.” The modified high cervical approach was devised and employed to address these issues at our institution. Materials and Methods: Patients who underwent surgery for anterior cervical C3-4 inclusive pathologies between January 2015 and April 2018 were included in the study. Parameters for considering difficult neck were defined. Patient subgroup with difficult neck underwent surgery through a modified high cervical approach, whereas others underwent surgery through a standard approach. The incidence of pharyngo-tracheo-laryngeal complications in both subgroups of this patient set was compared among itself as well with a similar patient set with the same two subgroups, both of which underwent surgery through standard approach alone from May 2010 to December 2014 – before the introduction of modified high cervical approach. Results: A total of 280 patients underwent surgery for C3-4 level pathology between May 2010 and April 2018. There were 197 males and 93 females in this population. Mean age was 45.8 ± 6.3 years. Incidence of pharyngo-tracheo-laryngeal complications was 20.3% in patients who underwent surgery before the employment of modified high cervical approach – 32.4% of difficult neck and 16.6% of others developed features of pharyngo-tracheo-laryngeal complications. After employment of modified high cervical approach, 16.67% of difficult neck and 16.2% of other patients developed features of pharyngo-tracheo-laryngeal complications. Conclusion: The modified high cervical technique is a good surgical option to prevent pharyngo-tracheo-laryngeal complications in cases of anterior C3-4 pathology when operating of patients with difficult neck. Surgery of the cervical spine involves a myriad of approaches including anterior and posterior approaches. Since its introduction, anterior cervical approach has become staple procedure for pathologies such as disc prolapse ossification of the posterior longitudinal ligament and other disease processes involving anterior elements of the spine. The procedure is, however, not free of its share of complications, namely, hoarseness of voice, high-pitch loss and singing difficulty, decreased cough impulse, and aspiration and dysphagia. Laryngeal nerve (LN) palsies are frequently cited cause of above-mentioned complications. Other factors implicated in causation of these complications are retraction injury to tracheoesophageal complex, laryngeal edema, and injury to microvasculature. Among LN palsies, recurrent LN (RLN) palsy is the more commonly known. Superior LN (SLN) palsy is comparatively less well documented putatively because the immediate effect of SLN palsy may not be as evident as RLN palsy. In addition, the tests for evaluation of SLN palsy are tedious and less frequently performed. These complications may be much more significant in cases of high cervical pathology such as C3-4 inclusive pathologies and may persist for significantly longer periods. In fact, Yue et al. reported significant rates of persistence of these complications at 5 years following an anterior cervical discectomy and fusion (ACDF) (singing difficulty persisted in up to 21.6% of cases) and these rates were significantly higher in pathologies around C3-4. At our institution, we found overall rates of 16.3% of these pharyngo-tracheo-laryngeal complications in all patients who underwent cervical spine. The rates were slightly higher in C3-4 level inclusive pathologies to the tune of 20.3%, though these were still comparable to those reported in the literature. Retrospective analysis showed that the reason for higher incidence in this patient group was that there was a subset of patients who showed much higher incidence (up to 32%) of features of pharyngo-tracheo-laryngeal complications. In all these patients, there were a few features in common comprising what we call, “difficult neck.” This includes a constellation of features such as short neck, restricted mobility of neck, and poor extension of neck on operating table. A higher incidence of complication in these patients led us to modify our technique of approaching cervical pathologies in this subset of patients with favorable results. This article presents a description of the aforementioned technique along with a comparison of results; inpatient subsets operated before and after introduction of this modified high cervical approach. Patients who underwent surgery for anterior cervical C3-4 pathology from January 2015 to April 2018 were included in the study. This group comprised patients with C3 and/ or C4 body pathologies and/or C3-4 discal pathologies. This included patients with “difficult neck” in whom modified high cervical approach was employed. This subset of patients was compared with a similar patient population who underwent surgery for anterior cervical C3-4 pathology through a standard approach between May 2010 and December 2014. Patients with difficult neck, who underwent surgery through a modified high cervical approach, between January 2015 and April 2018. Following parameters were considered when considering a patient as having a difficult neck. 9.65 × (0.0669 × sitting height). Evidence of torticollis or other neck abnormalities. Patients with pathologies spanning more than two vertebral segments except C3-4 were not included in the study. We believe that the retraction injury that occurs in surgery of anterior cervical pathologies is caused by the pull of retractors against the elastic resistance of the skin, platysma, and the cervical fascia. The hindrance caused by the bony structures such as the hyoid contributes adversely to this. In higher cervical region, in the presence of the inherent crowding of the corridor, these factors assume even more relevance. If such patients happen to have a “difficult neck,” the outcomes could be significantly worse than those in other patients as evident by the reported results. To this end, our modification begins from the skin level and focuses on minimizing the elastic resistance of various layers and has as its critical step release of hyoid to open up surgical corridor and to lessen retraction. Platysma is incised transversely, submandibular glad is exposed and retracted superiorly taking care to preserve its ducts, investing layer of the deep cervical fascia is split, and the retromandibular branches of the common facial vein are ligated. A submandibular gland resection for further exposure may lead to complications such as weakness of the lower lip depressor muscles, injury to lingual, and hypoglossal nerve., Facial artery is retracted superolaterally. Digastric muscle is seen attached to the greater cornu of hyoid with a facial sling which is released to mobilize the digastric muscle and expose the hypoglossal nerve lying deep to its posterior belly. Digastric release has another advantage of mobilizing hyoid away from the field causing wide exposure. The hypoglossal nerve is dissected along its course and retracted rostrally along with stylohyoid muscle which is divided and retracted. Once the carotid sheath is retracted laterally and the trachea esophageal complex and pharyngeal constrictor muscles are retracted medially, we can see that there are two corridors at this stage to access the upper and lower cervical columns extending from C2-6, superior and inferior to superior thyroid artery (STA) [Figure 1]. The supra STA corridor is a quadrilateral space, which is the corridor used primarily for high cervical pathologies and permits a safe entry route to C2-4 levels. Its borders are superiorly, hypoglossal nerve; antero-superiorly, hyoid and internal SLN (ISLN); medially, stylopharyngeus muscle; and laterally, carotid sheath. The lingual artery comes across in this space often which can be either retracted superiorly or sacrificed for adequate exposure. The infra-STA corridor may use in certain cases in conjunction with superior corridor in case the desired exposure is limited through the superior corridor. 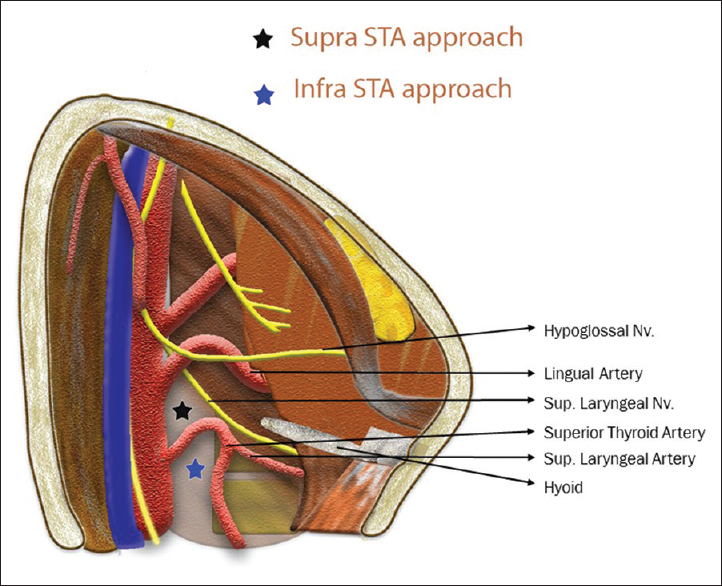 It may be noted that it is the release of hyoid that enables a wider and easier access through supra-STA corridor by “uncovering” the space previously hidden beneath hyoid. SLN descends medially toward the thyrohyoid membrane and lies in the paratracheal fascia covering the longissimus colli muscle and divides into internal and external branch at the level of carotid bifurcation. External SLN (ESLN) is found deep to STA. The internal branch of SLN identified just above the superior laryngeal artery (SLA) passes along with the SLA and enters the thyrohyoid membrane just inferior to the C3 vertebral body. ISLN is superficial near the greater cornu of hyoid and thus care must be taken while dissecting the hyoid. Once the vertebral body level is reached, the technique of discectomy and instrumentation is same as a standard Smith-Robinson approach. A total of 280 patients underwent surgery for C3-4 level pathology between May 2010 and April 2018. There were 197 males and 93 females in this population. Mean age was 45.8 ± 6.3 years. Of these, 163 patients underwent these surgical procedures before employment of the modified high cervical approach (between May 2010 and December 2014) and rest underwent surgery after its employment (between January 2015 and April 2018). Overall, incidence of pharyngo-tracheo-laryngeal complications was 33 patients of 163 (20.3%) in patients who underwent surgery before employment of modified high cervical approach. Among these, 37 had difficult neck. Of these, 12 patients (32.4%) had features of pharyngo-tracheo-laryngeal complications. On the other hand, among 126 patients operated during this period, who did not have difficult neck, 21 (16.6%) developed features of pharyngo-tracheo-laryngeal complications. In contrast, among the 117 patients operated after employment of modified high cervical approach, 18 had difficult neck. Of these, 3 (16.67%) patients had features of pharyngo-tracheo-laryngeal complications. 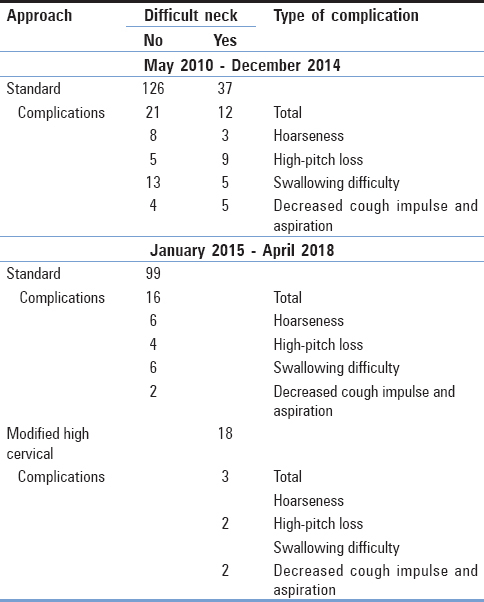 On the other hand, of the 99 patients operated during this period, who did not have difficult neck, 16 (16.2%) developed features of pharyngo-tracheo-laryngeal complications [Table 1]. As there is no significant difference between the incidences of pharyngo-tracheo-laryngeal complications such as high-frequency loss or dysphagia in patients without difficult neck in the two time periods, it is indicated that the other factors such as technological paraphernalia, skill of surgeon, and standards of care that may govern these results have had no confounding effect on the results. On comparing the results between patients with difficult neck who underwent surgery with standard approach to those with difficult neck who underwent surgery through modified high cervical approach, we see that there is a significant difference (P = 0.009) between the proportions of patients who developed pharyngo-tracheo-laryngeal complications. In fact, by employing modified high cervical approach for patients with difficult neck, we see that the rates of complications are similar to those without difficult neck. SLN branches off from the vagus nerve as the nerve exits from the jugular foramen, and it travels deep to the carotid artery. At the level of carotid bifurcation, SLN divides into ISLN and ESLN. ISLN travels more medially in an oblique pathway, and it exits the investing layer at the level of C3-4. Then, it takes a more transverse course, passes just inferior to the greater cornu of hyoid, and pierces the thyrohyoid membrane at the same level. ISLN gives off sensory fibers to the laryngeal mucosa and motor fibers to interarytenoid muscle. ESLN exits the investing layer at the level C4-5, travels inferomedially toward the pole of thyroid, deep to the STA, and supplies cricothyroid muscle. It was Flynn, who first recognized the importance and gravity of LN palsy in relation to these complications and found that though uncommon by itself, the LN palsy forms the largest number of complications of the anterior approach. LN injury can happen either due to direct injury due to retraction, postoperative hematoma causing secondary stretching, or ischemic injury due to insult to the neural vascularity., Need for increased exposure may make the surgeon retract excessively or to ligate vessels that come across the field. The same happens when the fascial dissection is not adequate or during re-surgery where extensive adhesions are present. RLN is at risk while retracting the tracheoesophageal complex medially when the nerve gets compressed between the thyroid lamina and endotracheal tube. Furthermore, the nerve sustains injury during excessive retraction. Direct trauma may happen sometimes which is more common in the right side where the nerve takes a more lateral course. ISNL can get injured either directly while dissecting the hyoid where the nerve is close to the greater cornu or indirectly due to retraction injury. ISLN is much thinner and lax compared to ESLN which makes ISLN less susceptible for retraction injury. ISLN mediates cough reflex by providing sensory supply to the laryngeal mucosa and motor supply to the interarytenoids, thus preventing aspiration. ISLN palsy causes impaired cough reflex which can lead to a postoperative risk of aspiration, reported as high as 3.2% in ACDF. Even though laryngeal mucosa has bilateral innervation, unilateral ISLN palsy can cause significant symptoms sometimes when there is an anatomical variation of one side ISNL being dominant. SLA supplies laryngeal mucosa and branches of ISLN. Damage to SLA can cause ischemic injury to the ISLN. ESLN provides motor supply to the cricothyroid muscle which makes the vocal cord tense by rotating the cricoid cartilage an important aspect in producing high pitched sounds. Damage to ESLN palsy can cause impaired high-pitch phonation, voice fatigability, and dysphonia with an intact cough reflex. The nerve is more susceptible to retraction injury since it is thicker and less lax than ISLN. ESLN injury is associated with singing difficulty due to impaired high-pitched phonation and difficulty in varying pitches and has been reported in particular, in C3-4 level ACDF where excessive retraction may be needed. It must, however, be borne in mind that not all cases of pharyngo-tracheo-laryngeal complications of dysphagia, hoarseness, impaired cough, or high-pitch loss are due to LN palsy nor all cases of LN palsy lead to these complications. The complications may result from a number of other factors not the least of which are graft or implant protrusion, infection, hematoma, or injuries to other nerves such as pharyngeal plexus, vagus, glossopharyngeal, or hypoglossal.,,,,,,,,,,,, Direct retraction injury to tracheoesophageal complex, laryngeal edema, and injury to microvasculature may also contribute to these complications. This becomes especially relevant in cases of higher cervical pathologies where the normal anatomic crowding makes retraction more necessary and puts the structure at greater risk. In fact, while Yue et al. reported 21.6% incidence of singing difficulty in 5-year post-ACDF follow-up, it was as high as 57.1% in if C3-4 level was included in surgery. In standard ACDF surgery, right RLN is at risk while operating the lower cervical levels and thus left side is preferred in such cases, whereas there is no such consideration for side in high cervical approach as there is no significant anatomical difference between both sides. SLN is at risk near the carotid bifurcation area where the nerve lies in the paratracheal fascia and it can get injured while placing the retractor to expose the upper levels. This can be avoided by dissecting the medial border of longissimus colli so that a groove is made for safe retraction and this prevents accidental slippage of the retractor causing nerve injury., ESLN courses adjacent to the STA and just deep to the vessel. Ligation or coagulation of STA may sometimes cause inadvertent injury to ESLN. This can be avoided by identifying cricothyroid muscle and upper pole of thyroid, followed by tracing the nerve rostrally. Greater cornu of the hyoid should be dissected carefully where the ISLN is very close to hyoid. Frequent release of retraction, avoidance of excessive retraction, and adequate facial dissection, especially while operating multiple levels or during re-surgeries, are other important techniques to prevent retraction injury to the nerves. Intraoperative neuromonitoring with electromyography can be used in difficult cases which is about 97% effective in identifying the SLN and its branches. A careful consideration of all the factors enumerated in available literature to prevent pharyngo-tracheo-laryngeal complications reveals the need of adequate exposure, fascial dissection, and minimal retraction. These nuances, however, are difficult to employ in cases where the neck mobility is affected on account of it being short, poorly extensible, or otherwise being difficult to manipulate, such as cases with torticollis, to name a few. The best efforts of surgeon in these cases to achieve a good surgical exposure and thus to avoid retraction despite an adequate fascial dissection may fail and thus these cases are more prone to develop pharyngo-tracheo-laryngeal complications. This is evident in our results wherein a significantly higher proportion of patients with difficult neck developed pharyngo-tracheo-laryngeal complications when employing a standard approach. The modified high cervical approach developed in consequence to these higher incidences of pharyngo-tracheo-laryngeal complications of dysphagia, high-frequency loss, etc., successfully provides adequate exposure and negates the detriments to preserving these functions and integrity of LNs in patients with difficult neck. The modified high cervical technique is a good surgical option to prevent pharyngo-tracheo-laryngeal complications such as dysphagia and high-frequency loss when operating on patients with difficult neck for anterior C3-4 pathologies. Yue WM, Brodner W, Highland TR. Persistent swallowing and voice problems after anterior cervical discectomy and fusion with allograft and plating: A 5- to 11-year follow-up study. Eur Spine J 2005;14:677-82. Mahajan PV, Bharucha BA. Evaluation of short neck: New neck length percentiles and linear correlations with height and sitting height. Indian Pediatr 1994;31:1193-203. Gupta S, Sharma KR, Jain D. Airway assessment: Predictors of difficult airway. Indian J Anaesth 2005;49:257-62. Vender JR, Harrison SJ, McDonnell DE. Fusion and instrumentation at C1-3 via the high anterior cervical approach. J Neurosurg 2000;92:24-9. Yoganandan N, Halliday A, Dickman C, Benzel EC. Practical anatomy and fundamental biomechanics. In: Benzel EC, editor. Spine Surgery: Techniques, Complication Avoidance, and Management. Philadelphia, PA: Churchill Livingstone; 2005. p. 126-7. Russo A, Albanese E, Quiroga M, Ulm AJ. Submandibular approach to the C2-3 disc level: Microsurgical anatomy with clinical application. J Neurosurg Spine 2009;10:380-9. Behari S, Banerji D, Trivedi P, Jain VK, Chhabra DK. Anterior retropharyngeal approach to the cervical spine. Neurol India 2001;49:342-9. Hsu AK, Kutler DI. Indications, techniques, and complications of major salivary gland extirpation. Oral Maxillofac Surg Clin North Am 2009;21:313-21. McAfee PC, Bohlman HH, Riley LH Jr., Robinson RA, Southwick WO, Nachlas NE, et al. The anterior retropharyngeal approach to the upper part of the cervical spine. J Bone Joint Surg Am 1987;69:1371-83. Park SA, Lee JH, Nam YS, An X, Han SH, Ha KY, et al. Topographical anatomy of the anterior cervical approach for c2-3 level. Eur Spine J 2013;22:1497-503. Dohn DF. Anterior interbody fusion for treatment of cervical-disk conditions. JAMA 1966;197:897-900. Connolly ES, Seymour RJ, Adams JE. Clinical evaluation of anterior cervical fusion for degenerative cervical disc disease. J Neurosurg 1965;23:431-7. Bulger RF, Rejowski JE, Beatty RA. Vocal cord paralysis associated with anterior cervical fusion: Considerations for prevention and treatment. J Neurosurg 1985;62:657-61. Winslow CP, Winslow TJ, Wax MK. Dysphonia and dysphagia following the anterior approach to the cervical spine. Arch Otolaryngol Head Neck Surg 2001;127:51-5. Heeneman H. Vocal cord paralysis following approaches to the anterior cervical spine. Laryngoscope 1973;83:17-21. Welsh LW, Welsh JJ, Chinnici JC. Dysphagia due to cervical spine surgery. Ann Otol Rhinol Laryngol 1987;96:112-5. Lunsford LD, Bissonette DJ, Jannetta PJ, Sheptak PE, Zorub DS. Anterior surgery for cervical disc disease. Part 1: Treatment of lateral cervical disc herniation in 253 cases. J Neurosurg 1980;53:1-11. Winslow CP, Meyers AD. Otolaryngologic complications of the anterior approach to the cervical spine. Am J Otolaryngol 1999;20:16-27. Edwards CC 2nd, Karpitskaya Y, Cha C, Heller JG, Lauryssen C, Yoon ST, et al. Accurate identification of adverse outcomes after cervical spine surgery. J Bone Joint Surg Am 2004;86-A: 251-6. Frempong-Boadu A, Houten JK, Osborn B, Opulencia J, Kells L, Guida DD, et al. Swallowing and speech dysfunction in patients undergoing anterior cervical discectomy and fusion: A prospective, objective preoperative and postoperative assessment. J Spinal Disord Tech 2002;15:362-8. Weisberg NK, Spengler DM, Netterville JL. Stretch-induced nerve injury as a cause of paralysis secondary to the anterior cervical approach. Otolaryngol Head Neck Surg 1997;116:317-26. Haller JM, Iwanik M, Shen FH. Clinically relevant anatomy of high anterior cervical approach. Spine (Phila Pa 1976) 2011;36:2116-21. Netterville JL, Koriwchak MJ, Winkle M, Courey MS, Ossoff RH. Vocal fold paralysis following the anterior approach to the cervical spine. Ann Otol Rhinol Laryngol 1996;105:85-91. Park SH, Sung JK, Lee SH, Park J, Hwang JH, Hwang SK, et al. High anterior cervical approach to the upper cervical spine. Surg Neurol 2007;68:519-24. Eckley CA, Sataloff RT, Hawkshaw M, Spiegel JR, Mandel S. Voice range in superior laryngeal nerve paresis and paralysis. J Voice 1998;12:340-8. Buchholz D, Ravich W. Dysphagia following anterior cervical fusion. Dysphagia 1993;8:387-91.